So wrote Chinua Achebe in his great novel, Things Fall Apart, set among the Igbo people in southeast Nigeria. His words are a reminder that men’s and women’s experiences, needs, activities and ambitions in the agricultural sphere can often be different – and that women’s contributions are all too often undervalued. Cassava feeds more than half a billion people in the in the developing world. After rice and maize, it is the third-largest source of carbohydrates for people in the tropics, where it is grown across Africa, Asia and Latin America. 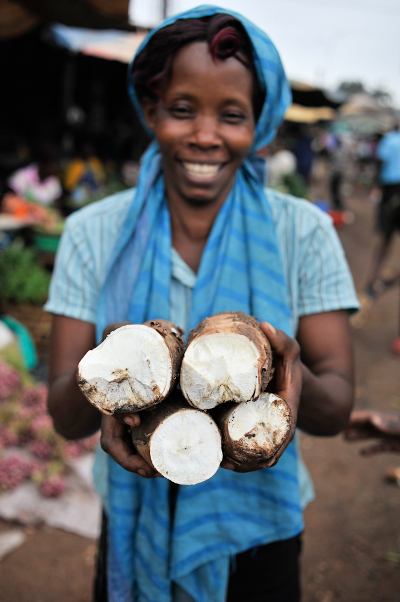 Yet tough, unassuming cassava is a bit of an underdog – just like the women who grow it. 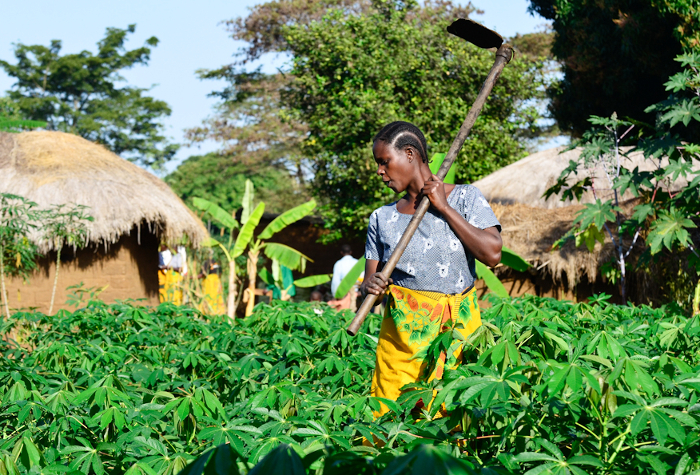 We are celebrating the International Day of Rural Women by taking a special look at cassava, what it means for women, and the extraordinary things that can happen when Things Come Together! 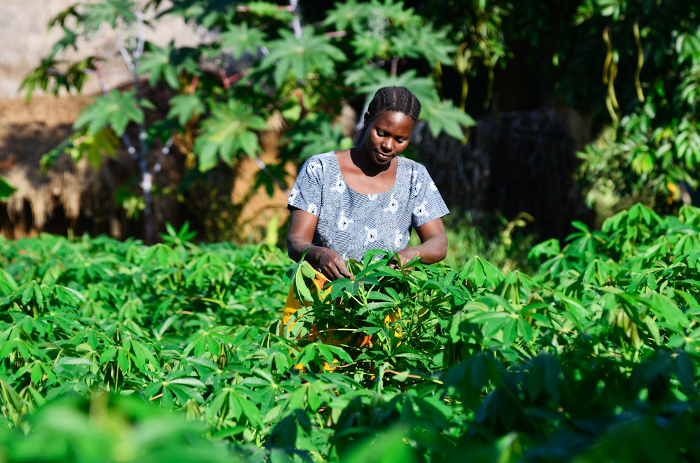 A bright spot in a sea of green: a farmer in her field of cassava, in the village of Tiniu, near Mwanza, northern Tanzania. 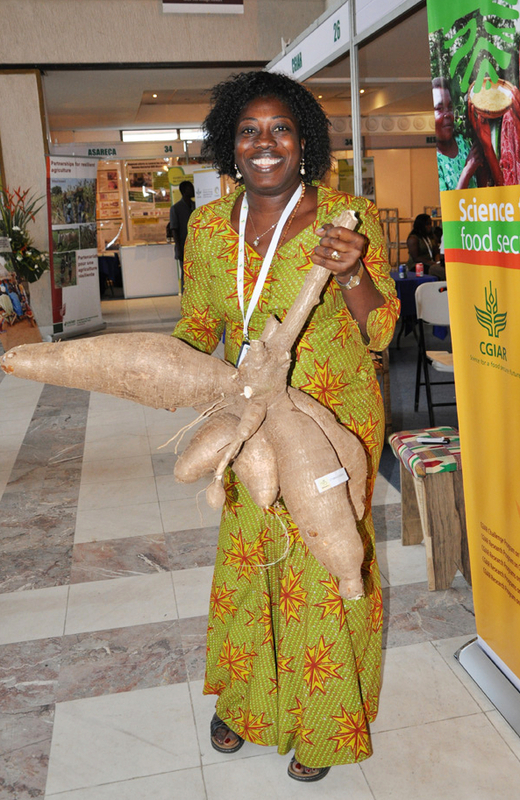 Hefty chunks of cassava – full of energy and nutrients – on sale in Kampala, Uganda. 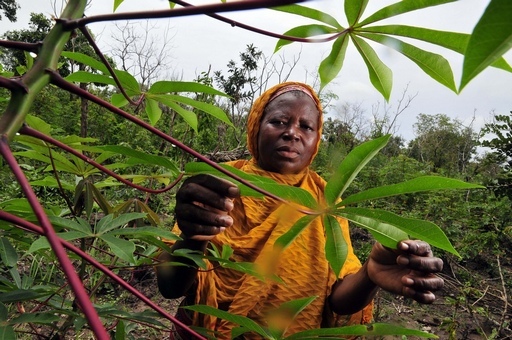 Cassava’s story is one that is inextricably linked to centuries of pain and struggle. It was introduced to Africa in the 16th century by Portuguese traders who brought it from Brazil – and took Africans back to Brazil as slaves. Yam, native to Africa, was firmly established as the staple food of the Igbo people. Dominating their farming activities, it thus dominated the very routine of existence. So, control of yam affirmed men’s position at the top of the pinnacle. 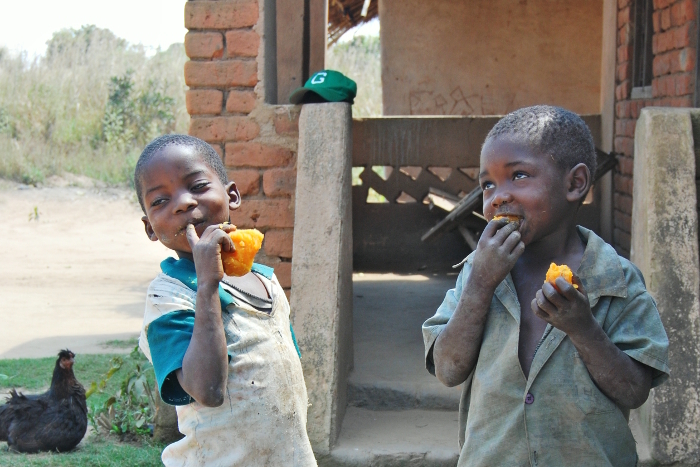 When cassava arrived, no one thought very much of it. For the Portuguese, it was a cheap source of carbohydrates. 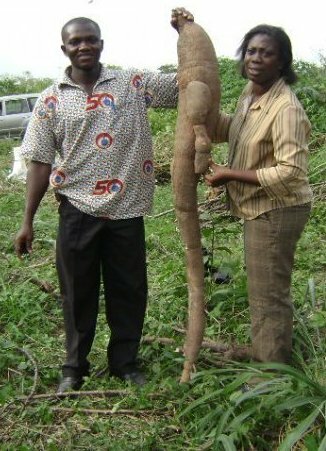 For the Igbo, it was a decidedly inferior crop to the long-beloved and much-revered yam. 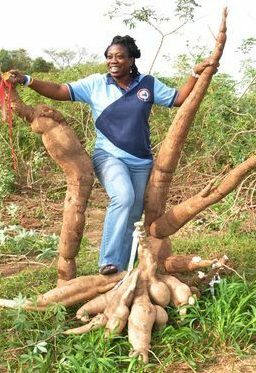 Since the men were generally not much interested, Igbo women gradually adopted cassava as ‘their’ crop, a process that has been reinforced over the centuries. For example, Nigerian troop conscription during the First World War and the subsequent influenza pandemic caused a serious shortage of labour, particularly manpower. 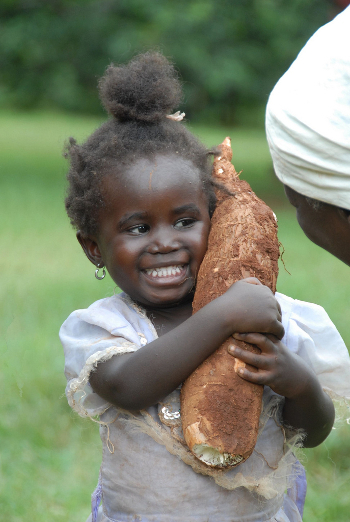 Women needed to grow more food, and cassava – more flexible and less labour-intensive than yam – was the natural choice, being also free from the cultural constraints that made yam the exclusive domain of men. 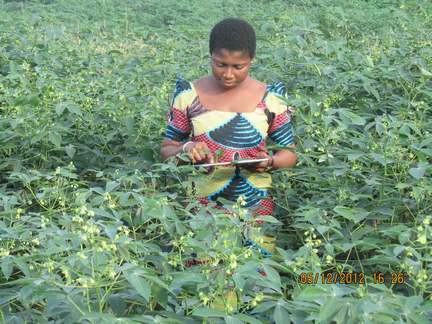 While no one would call cassava glamorous, plenty of women over the years have turned out to be quite happy that such a valuable crop ended up in their sphere of influence. 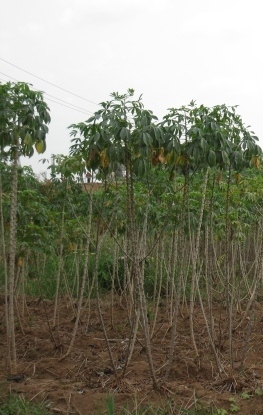 While cassava is not often much of a cash crop in Africa, it is tough, resilient, and very useful for survival in difficult times. 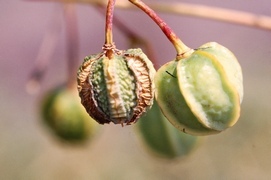 It thrives on poor soils where other plants struggle, and it survives droughts that leave other crops biting the dust. 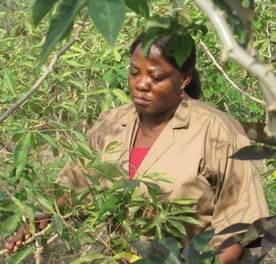 For many rural mothers, cassava is the crop that keeps their families alive. 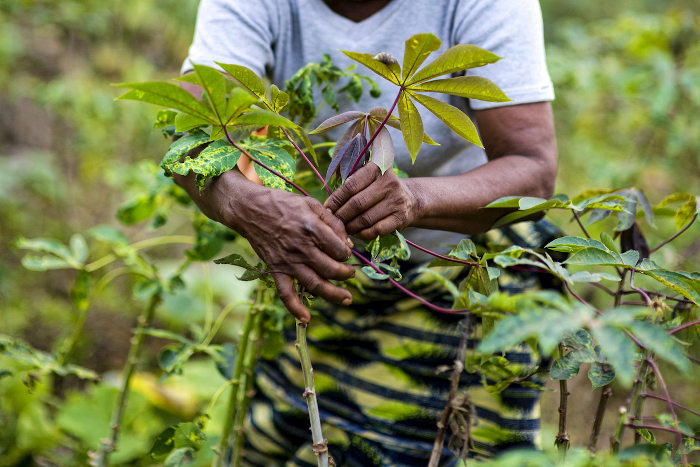 The hard-working hands of Angelique Ipanga, a teacher and farmer, as she tends her cassava crop in Lukolela, Democratic Republic of Congo. 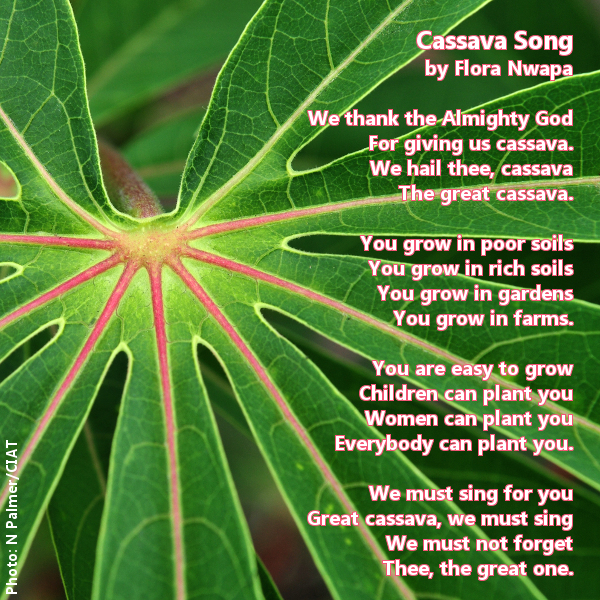 What better words to sing cassava’s praises than those of Flora Nwapa, Nigeria’s first female novelist, in her Cassava Song? In ancient Igbo tradition, women sing their work, singing it into being and into completion, and her poem is a tribute to those work-songs. 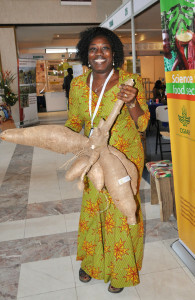 Of course, cassava is not exclusively a female province – it is grown by both women and men farmers around the world. But can you blame us for imparting it with a special feminine mystique, when legend has it that the first cassava was birthed by a human woman caught at the confluence of two cultures? 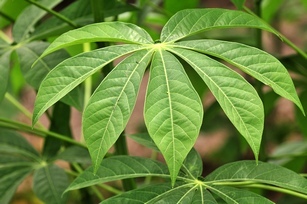 Many centuries before the Europeans arrived, cassava – often known in the New World as manioc – sustained peoples and cultures throughout the tropical lowlands of the Americas. 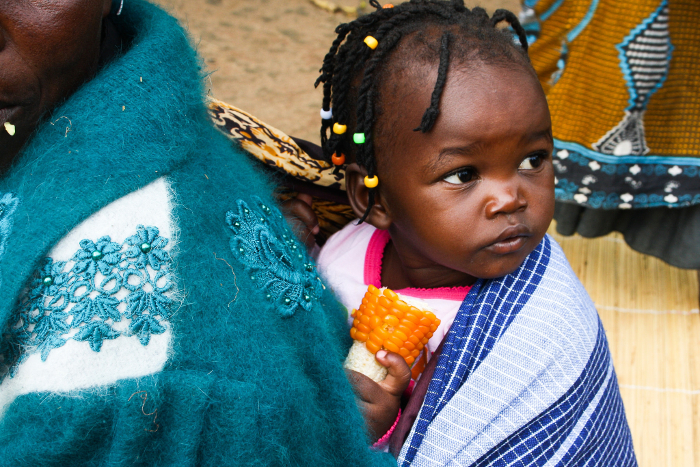 The Tupí people of Brazil tell how, many years ago, the daughter of a chief became pregnant. Although she said that she had not been with a man, her father did not believe her, and threatened to kill her if she did not tell him the name of the child’s father. When he slept, however, he dreamt of a white-skinned warrior who told him that his daughter was telling the truth, and that one day, she would bear a great gift for all his tribe. The chief’s daughter gave birth to a little girl, Maní, whose skin was as white as the moon and eyes were as dark as the night. She grew into a happy and beautiful baby, but died suddenly after her first birthday. Her mother watered the grave every day, as was the custom, and one day, a strange plant grew there that no one had ever seen before. Later, the earth cracked open, and the Tupí people saw a fruit that was as white as the dead child. They drew it from the ground, peeled and cooked it, and to their surprise found that it was delicious, and even renewed their strength. They called it mandioca or manioca, meaning ‘House of Maní’. It is a haunting tale, rich with echoes of the cultural upheavals that followed the coming of the Europeans, ancient fears of female impurity, and the realities of infant mortality. But it leaves one thing in no doubt: poor little Maní’s legacy was a precious treasure, not just for the Tupí but for the world. 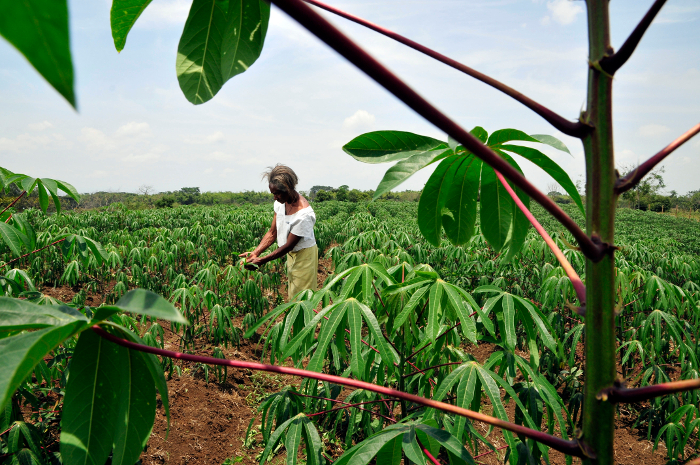 Under the hot sun, the work goes on: a farmer tends her cassava crop in Colombia’s southwestern Cauca department. Female farmer reloaded: Being a rural woman farmer does not mean you have to have dirt under your fingernails all the time. Here’s Bea looking as elegant and regal as any queen. 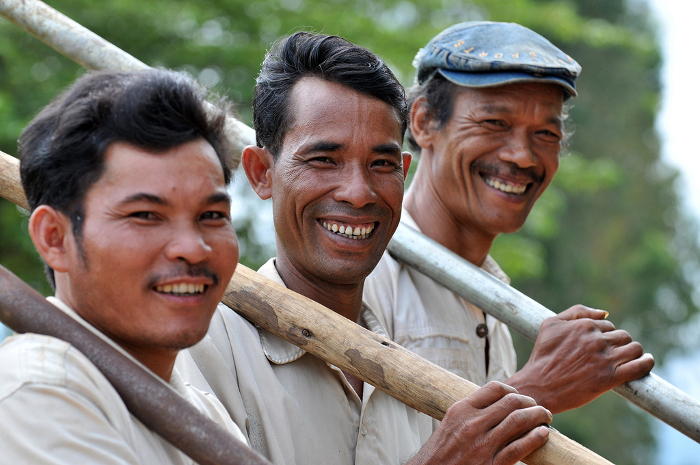 When most people think of a farmer, they probably think of a man in a straw hat. But in defiance of this stereotype, women make up 43 percent of the agricultural labour force in developing countries, rising to at least 50 percent in sub-Saharan Africa and Eastern Asia. These millions of rural women have incredibly diverse lives, but a few things stay surprisingly constant. 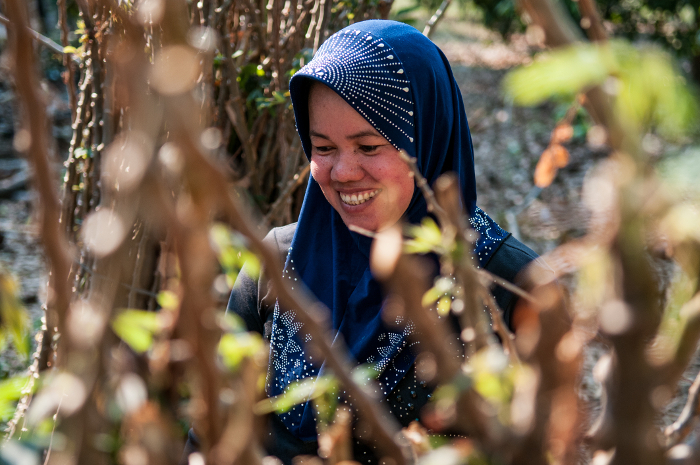 Female farmers tend to produce less than their male counterparts – not because they are worse at farming, but because they have less access to all kinds of resources and opportunities. 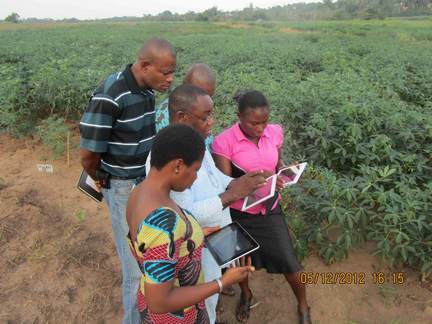 These include anything from land itself to improved seed and new technologies, and from education and information to financial credit. Listen to Elizabeth in the podcast below, and you are bound to pick up her infectious enthusiasm! Elizabeth Parkes is a woman from Ghana, and Chiedozie Egesi is a man from Nigeria, himself of the Igbo people and a yam breeder in a past life. However, the two have a lot in common. 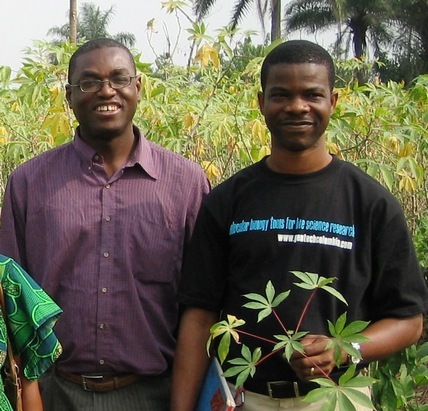 They are dynamic African scientists with a passion for social justice, and for helping the poorest and most disadvantaged rural people through their work on cassava. 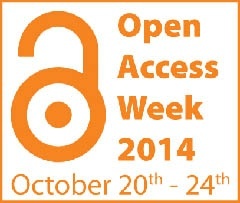 When scientists like these come together, with a dash of the right support, marvellous things happen. Read Elizabeth’s story here and more from her here, and catch up with Chiedozie here and here. 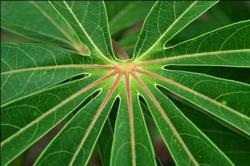 Cassava has traditionally been a forgotten ‘orphan’ in crop science research. Humble and unfashionable, it also has some special challenges for breeders, like its long growth cycle and complicated genetics, while its tough and uncomplaining nature meant that many people thought of it as an “anywhere, anyhow” crop – a very misleading myth, if ever there was one (with thanks to myth-buster Joseph Adjebeng, for that memorable cassava quote). 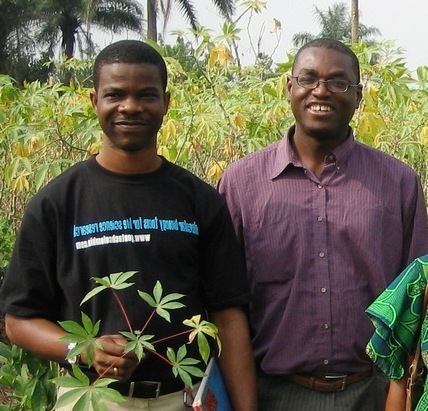 Although the idea grew from a kernel of truth, cassava, like any other crop, needs a little love, and yields less when plagued by problems such as diseases or degraded and infertile soils. But, like Harry Potter, in recent years this orphan has come out from the cupboard under the stairs, and the magic has begun. 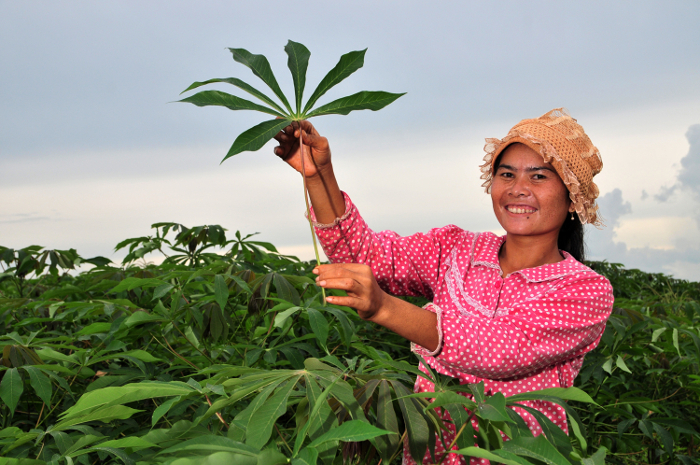 Wreathed in sunlight and smiles, a cassava farmer inspects her crop in Kratie, Cambodia. 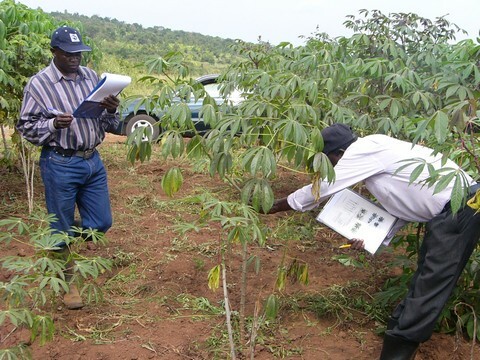 The plus side of cassava being neglected for so long is that it only needed a relatively small initial investment in local capacity-building and applying modern breeding methods to make a big impact, and set the ball rolling for serious cassava research. 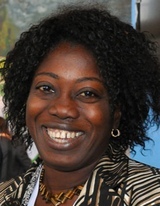 “GCP helped us to build an image for ourselves in Nigeria and in Africa, and this created a confidence in other global actors, who, on seeing our ability to deliver results, are choosing to invest in us,” explains Chiedozie. 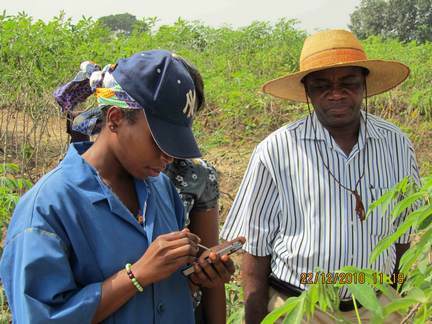 His team have released new cassava varieties that are resistant to diseases and rich in pro-vitamin A, providing the vitamin A that is particularly important for small children and childbearing women. He believes that these have the potential to transform the lives of the people – mainly rural women – who grow them. “The food people grow should be nutritious, resistant and high-yielding enough to allow them sell some of it and make money for other things in life, such as building a house, getting a motorbike, or sending their kids to school,” he says. After all, it seems that being a ‘woman’s crop’ might not be a put-down, but something to celebrate. 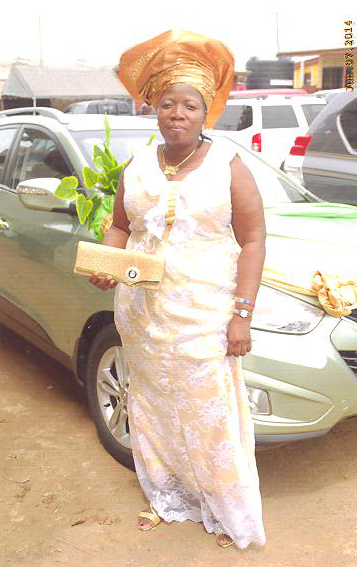 Cassava has come a long way, from a pale princess lying under the earth, to a steadfast mother keeping the family going in the toughest of times, to a confident and majestic queen with a glorious reign ahead of her. And so, for October 15th, in honour of the International Day of Rural Women, we crown her the Queen of Crops. Long live Queen Cassava! Colourful streamers for the coronation? 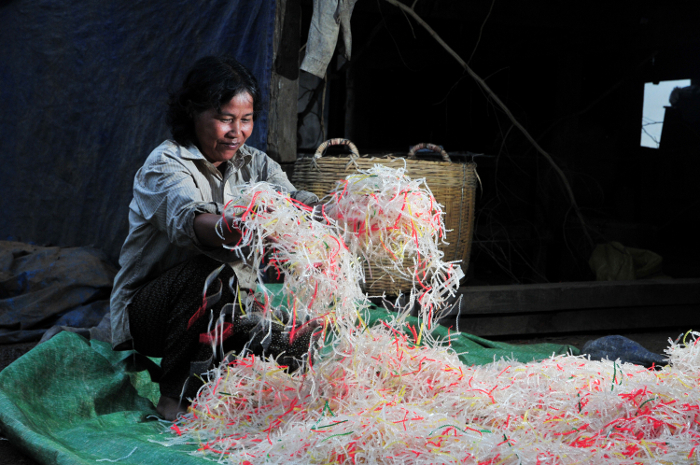 No, they’re cassava noodles being made in Kampong Cham, Cambodia. 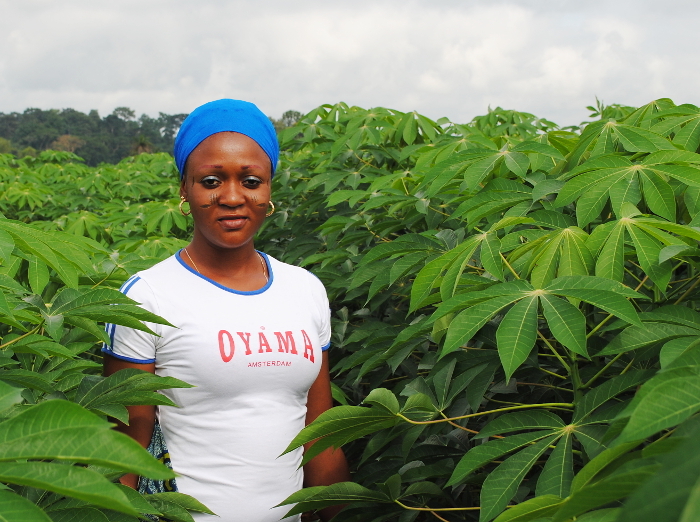 A regal African beauty tends her gorgeous cassava plants.